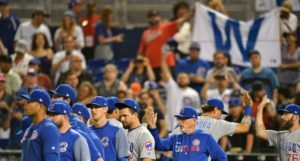 What Do the Cubs Actually Need for a Successful 2019 Season Down on the Farm? It isn’t hard to argue that the 2019 season will be the most important one for the Cubs farm system since 2016. The Major League team could have legitimate holes the farm could alleviate. A slow winter could create the need for midseason trades that will demand attractive prospects. A lack of payroll flexibility makes cost-controlled young players more important than ever. 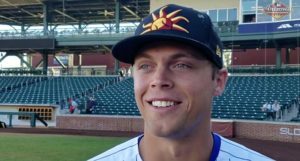 When it last happened: Before the 2017 season, when Ian Happ and Albert Almora still counted as prospects. But what we’re really aspiring to see for the Cubs is a return to those 6-7 prospect days of pre-2014/2015. Candidates: Anyone in the top 10 in the system (conversation for a different day!) is capable. Picks: Miguel Amaya, Nico Hoerner, Brailyn Marquez, Cole Roederer. When it last happened: C.J. Edwards in 2016. He didn’t arrive to Chicago that season until June 22, but was obviously a stalwart by October. Candidates: Dakota Mekkes, Dillon Maples, Rowan Wick, Adbert Alzolay, Justin Steele, James Norwood, Duane Underwood. Pick: I’ll go a little bold. My prediction is that Justin Steele comes to the Majors in September (after 15-20 Double-A starts) and gains a lot of trust as a left-handed option. But seeing the Cubs give up on Steele as a starter in 2020 seems unlikely, so you can’t quite call that “sticking.” I’ll also say that Dakota Mekkes shows enough to earn a benefit-of-the-doubt 2020 bullpen slot. When it last happened: Ah, jeez, I wasn’t here to bum anyone out. Surely Edwards, Pierce Johnson, and Rob Zastryzny don’t count, as all ultimately got looks in the bullpen. Guys like Jen-Ho Tseng and Duane Underwood and Alec Mills got starts in recent years, but none has quite earned a full-time look. So, outside of Kyle Hendricks, who would it even have been last? Maybe Andrew Cashner? Or is the real answer … Jeff Samardzija? Mercy. Candidates: Alzolay, Trevor Clifton, Duncan Robinson, Matt Swarmer, Steele, Mills, Alex Lange, Keegan Thompson, Tyson Miller, Michael Rucker, Tom Hatch, Cory Abbott. Pick: Again, I’ll stay a little outside the obvious and go with Thompson. In 11 of his 25 starts last year, Thompson allowed 0 runs. He had the best single start in the Cubs system, 7 perfect innings on June 14. 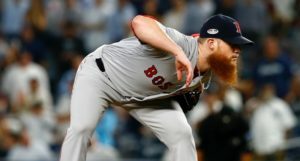 If Cubs infrastructure can get Thompson to add a mile or two to his fastball, or maybe a little more spin to his breaking balls, he immediately screams big leaguer with his advanced feel and combination of usable pitches. The most polished hurler from the college-pitching heavy 2017 draft class, Thompson made it to AA in his first full pro season. Once more of a power arm before 2016 TJS at Auburn, Thompson has transformed himself from thrower to pitcher. 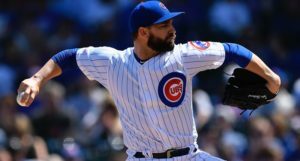 When it last happened: Whether it’s the original scouting report coming true (Eloy Jimenez in 2016), a swing change (Jason Vosler), or a launch angle change (Bote), this has been a recent strength in the Cubs player development department. Candidates: As David Bote – and Willson Contreras before him – proves, anyone in the farm system is fair game here for a ceiling change. Picks: Ian Rice and/or Kevonte Mitchell. For Rice, his ISO dropped in 2018 despite nearly doubling his LD% (12.9 to 24.7) and pulling the ball 7% more often. I think the (presumptive) move to the PCL will bring a nice big jump in his HR/FB%. If he leads the system in home runs, I wouldn’t be shocked. Mitchell is a deeper sleeper, as he OPS’d just .463 in his final 39 games before a season-ending injury last summer. But he hits the ball hard, and as you can see here, he’s showing launch angle progress. When it last happened: Last year! Brailyn Marquez came to camp last year with some added weight and slowly from spring to summer saw his fastball rise from the low- to high-90s. Note that Yovanny Cruz had a mini-breakout last year, too, so I’ve omitted him from candidacy. Candidates: Danis Correa, Jeremiah Estrada, Kohl Franklin, Eduarniel Nunez, Chris Allen, Didier Vargas, Yunior Perez. Pick: Correa has the best raw stuff, reportedly touching 100 mph on some radar guns last summer. But I’m most bullish on Estrada, who has struggled with injuries since signing for $1 million, but gets people giddy about his stuff/pitchability mix seemingly every time he throws a bullpen. When it last happened: Aramis Ademan skipping the AZL, putting 39 great games in Eugene, and reaching South Bend at 18 years old was a really cool thing in 2017. Candidates: Reivaj Garcia, Fabian Pertuz, Pedro Martinez, Luis Verdugo, Luis Vazquez, Chris Morel, Josue Huma, Yonathan Perlaza. Pick: I’ll plead ignorance here; each one feels like a fun lottery ticket with virtually the same chance of hitting it big. And yet, I like my odds better having eight of them. I’m probably most excited to see Colombian 18-year-old Fabian Pertuz in the States the most, as he posted a really fun .298/.419/.427 batting line in the Dominican Summer League last year, with 36 steals and a 38/32 BB/K in 62 games. When it last happened: To varying degrees, it happens every season. It’s the cross the Player Development Department bears. Matt Swarmer and Trent Giambrone were the best examples last year, and, even in a down system, you do see it every year. Candidates and Pick: We’ll dive into this next time! Hi there. I’m Bryan. I’m new around here, although I’ve been lurking as a BN reader since the early days. I used to write about minor league baseball in a few other spots. I have also been posting anonymously over at this @CubProspects Twitter account since last April. This season, I’m going to write about the minor league goings-on right here. Before I get to #content, let me just add what has been said about Luke. I stopped writing six years ago; I wanted to just be a fan again. And as a reader of this site, Luke made the rebuild exciting. I was one of many that woke up in the morning more excited to read Luke’s recap from Javy’s night in Daytona than I was about the Cubs loss I’d slept through. Luke’s consistency and breadth in covering the system is one serious tough act to follow. And listen, just so my credibility’s not too shot from the Chris Carpenter quote at the top – just know I ranked BDJ Lester #48 pre-2005. Baseball America? Not in the top 100. Boom, roasted. Let’s hope Brailyn’s 2019 looks something like Jon’s 2005 did. Bryan Smith is a Minor League Writer at Bleacher Nation, and you can find him on Twitter at @cubprospects. Win Probability Fun: Which 3 Hitters and Which 3 Pitchers Have Helped the Cubs “Win” the Most? Sponsored: 25% Off ALL ORDERS Today at Fanatics!